Jared Goff threw for 354 yards and three touchdowns as the Rams defeated the Chargers, 35-23, Sunday in the first regular-season NFL game between two Los Angeles teams since 1994. Todd Gurley ran for 105 yards and a touchdown on 23 carries as the Rams (3-0) continued their best start since 2001 when they won their first six games en route to their most recent Super Bowl berth. Philip Rivers completed 18 of 30 passes for 226 yards and two touchdowns for the Chargers (1-2), who have a losing record through three games for the third consecutive season and fourth time in five years. 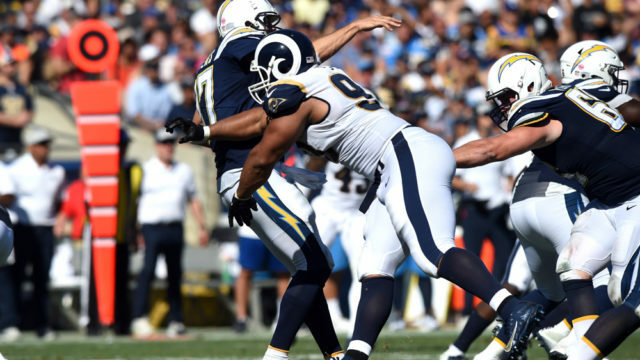 The Chargers lost two fumbles, the first of which the Rams converted to a touchdown, had a punt blocked, which Blake Countess recovered in the end zone for a touchdown, and missed an extra-point kick. The Rams outgained the Chargers, 521 yards to 356, led 33-16 in first downs and 34:16-25:44 in time of possession. 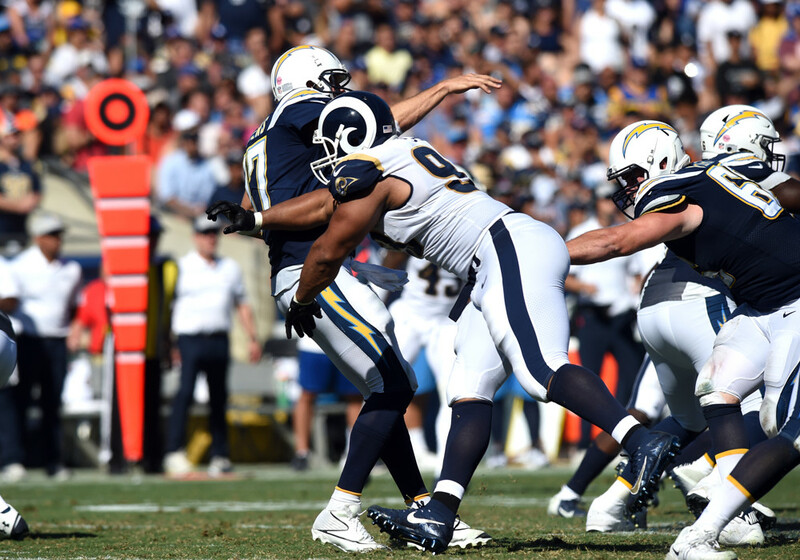 The Rams were successful on eight of 11 third-down conversions, 72.7 percent, the Chargers seven of 13, 53.8 percent. Goff completed 26 of 36 passes and had one pass intercepted, the third time a quarterback has thrown for at least 350 yards while completing at least 75 percent of his passes in consecutive games. The others are then-Kansas City Chiefs quarterback Trent Green in 2004 and Ryan Fitzpatrick of the Tampa Bay Buccaneers this season. The Rams offensive line was “incredible today, as they have been the first three games,” Goff said. The Rams allowed 141 yards on 20 rushes, including 97 yards on 12 carries in the second half. Melvin Gordon led the Chargers with 80 yards on 15 carries. The Rams never trailed in the game at the Los Angeles Memorial Coliseum, in which paid attendance was 68,947. The Rams opened the scoring with six minutes, 14 seconds left in the first quarter when Gurley completed an 11-play, 80-yard drive with a 1-yard touchdown run. Goff completed all six of his passes on the drive for 69 yards, including a 16-yard pass to Brandin Cooks on the play before the touchdown. The Chargers scored three plays later on Rivers’ 42-yard touchdown pass to Mike Williams but did not tie the score because Caleb Sturgis missed the extra point. The points were the first allowed by the Rams since a field goal with 10 seconds left in the first half of their season opener against the Oakland Raiders Sept. 10, two games ago. On the Rams ensuing possession, Goff was six-for-six for 54 yards, including a 3-yard touchdown pass to Robert Woods, and scrambled 16 yards for a first down on the seven-play, 75-yard drive. The Rams increased their lead to 21-7 7:44 before halftime when Cory Littleton blocked Drew Kaser’s punt and Countess recovered the ball in the end zone for the first touchdown in his 24-game NFL career. “That was a turning point in the game force right there,” Rams coach Sean McVay said. It was the first time Kaser had a punt blocked in his 35-game NFL career. The Chargers responded with a 10-play, 75-yard drive, capped by Gordon’s 11-yard touchdown run. Rivers completed three of six passes for 61 yards. Goff threw a 53-yard touchdown pass to Cooper Kupp on the Rams first possession of the second half, three plays after cornerback Aqib Talib forced Keenan Allen to fumble after caching a 10-yard pass from Rivers. Rams safety Lamarcus Joyner recovered the ball at their own 45-yard line. Both teams scored on their next possessions, with Rivers throwing a 20- yard touchdown pass to Williams and Goff a 6-yard touchdown pass to Woods. Woods caught 10 passes for 104 yards, both game highs. Sturgis kicked a 26-yard field goal with 11:49 left for the only points in the fourth quarter. Rams receiver-returner JoJo Natson broke a hand “so he’s going to be out,” McVay said. Natson was signed Sept. 12 after receiver Pharoh Cooper, a 2017 Pro Bowl selection as a kick returner, was placed on injured/reserve because of an ankle injury. Natson averaged 17.6 yards on his eight punt returns in two games with the Rams, third in the league among players with a least four returns. Talib and fellow cornerback Marcus Peters suffered ankle injuries, but McVay said he was “not exactly sure” how severe they way. Outside linebacker Dominique Easley suffered a knee injury, returned to the game but “didn’t feel great,” McVay said. “If those guys aren’t able to go, it’s going to be some big voids that we’ve got to be ready to fill” for Thursday’s game against the Minnesota Vikings, McVay said.